Place all dressing ingredients in a food processor and pour in olive oil, blend until smooth, season with salt and pepper. Cut tortillas into match sized sticks. Heat oil in sauté pan over med-high; fry tortillas until crisp. Remove with slotted spoon and drain on paper towels, salt. Set aside. Toss lettuce in large bowl with half of the crumbled cheese, roasted tomatoes, chicken and as much salad dressing as you want. 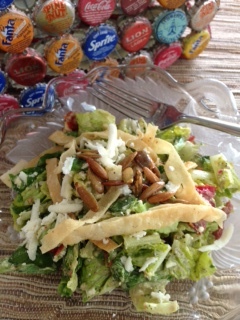 Top with the remaining cheese, pepitas and fried tortilla strips. Serves 4-6. *To poach chicken breasts: Start by filling a sauce pot with cold water and IF YOU HAVE AVAILABLE add a few splashes of white wine, scatter in some roughly chopped onion, celery and carrots and also peppercorns and a couple parsley sprigs with stems, IF NO cold water is fine. Bring the pot to a full boil, immediately remove from the heat, cover and let cook 20 minutes.